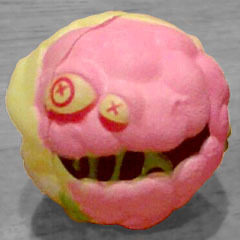 So, someone who reads the site has gotten a few of the new blind-bagged Madballs, and offered the opportunity for us to take a look at them without me having to spend my own money on them. Let's hear it for helpful fans! Skull Face is always plotting elaborate plans. Too bad his brain has a mind of its own - literally! - and loves to ruin every scheme. 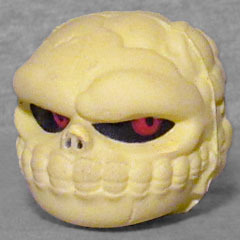 Skull Face was one of the original Madballs, dating all the way back to the '80s. Back then, he was just a grinning skull with bright white teeth, red eyes in black sockets, and a few dark holes on his right side. The 2007 Art Asylum version upped the ante, making the skull more anatomically correct, while also adding a tongue, a metal plates screwed onto the back of the head, and making the exposed brain much more prominent. But now, a decade later, here comes the Just Play version, where the brain is technically a separate character, and so fittingly takes up about 40% of the toy's surface. 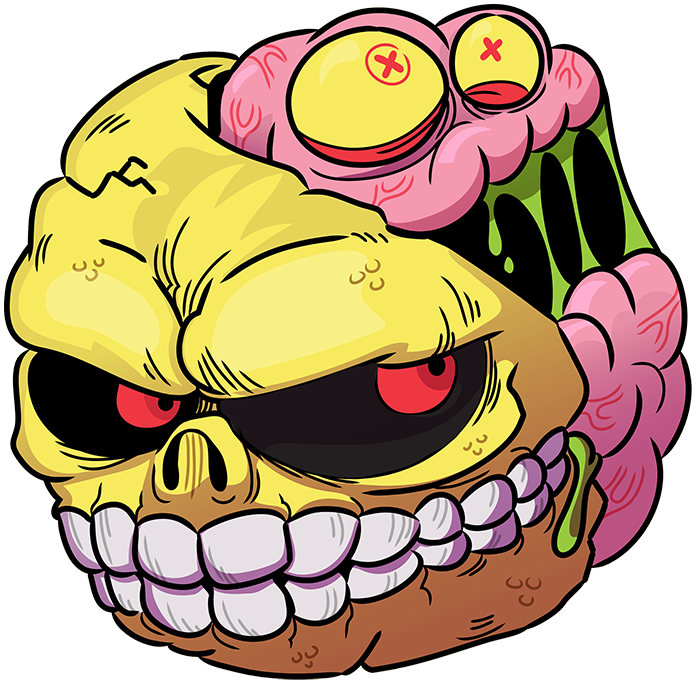 So far, there's no sign of the new Madballs updating the old Crack Head/Bash Brain character, so maybe exposing Skull Face's brain is their nod to him. On the normal Skull Face, the brain (who's named "Lobe" in the web cartoons) is painted pink, with yellow eyes, red eyelids, and green saliva in his mouth. 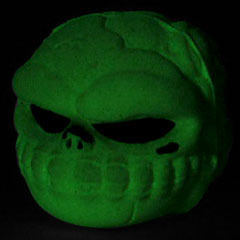 Absolutely none of that is present here, because this is the quote/unquote "ultra rare" glow-in-the-dark Skull Face. the entire thing is molded in pale foam that does, as advertised, glow in the dark. His eyes are painted black with red pupils, and his nasal cavity gets an app as well. But what's weird is that there's also a touch of paint on the bridge of his nose and on his cheek - were those factory touch-ups to cover a mistake, or is he actually designed that way? Because it leaves dark spots on the skull. I really wish they'd painted Lobe for this release, too: just having Skull Face be glowy would have been enough, his his brain going dark when the lights go out. Series 2 of the blind bags featured "Mix-Ups," re-releases from Series 1 with new colorschemes. Skull Face MX has green bones and a purple brain, which makes for a nice new combo. 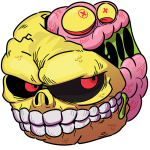 This entry was posted in blog exclusive review and tagged GitD, Madballs. Bookmark the permalink.